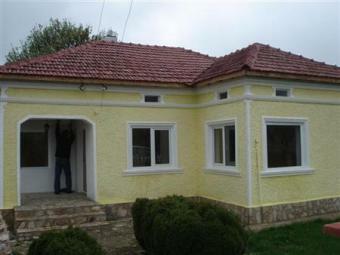 Description: EXCELLENT...FULLY RENOVATED BEAUTIFUL HOUSE !!! The village which has all amenities is in a wonderful location being only 14km away from Dobrich (Dobrich has many shops, bars and restaurants), 32km from the coastal resort at Balchik and approx 35 minutes from the airport at Varna. This excellent house it s not far away from the popular sea resort Albena. The house is renovated, it is one-storey house. It consists of living room, 2 corridors, 2 bedrooms, bathroom and WC and also BBQ. The yard is with total area 1100 sq. m. This is really a fine house ! DON`T DELAY-BARGAIN !